Here is the kit as I received it. 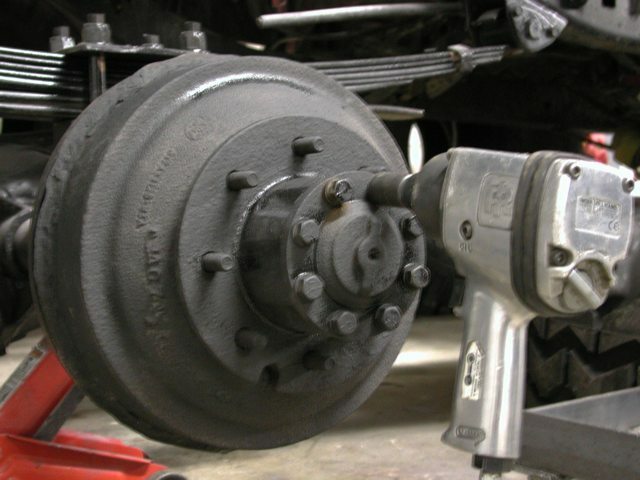 It will fit Ford Dana 60 72-79 8 lug full float rear axles. Your choice of E-brake or non-e-brake. I chose the non E-brake kit. 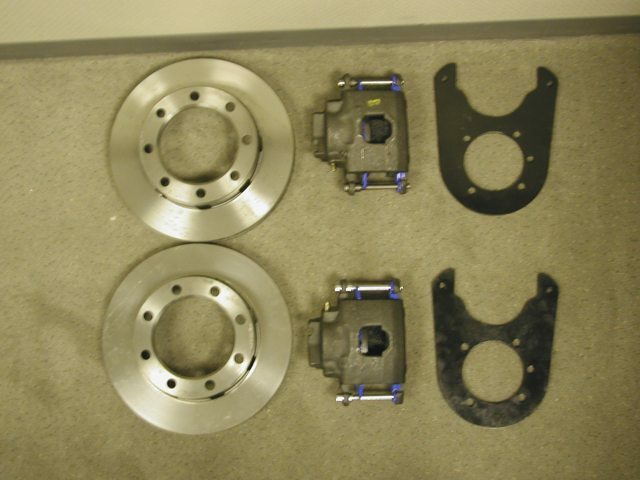 Kit includes: 2 backing plates, 2 new rotors 2 calipers with pads and bolts. 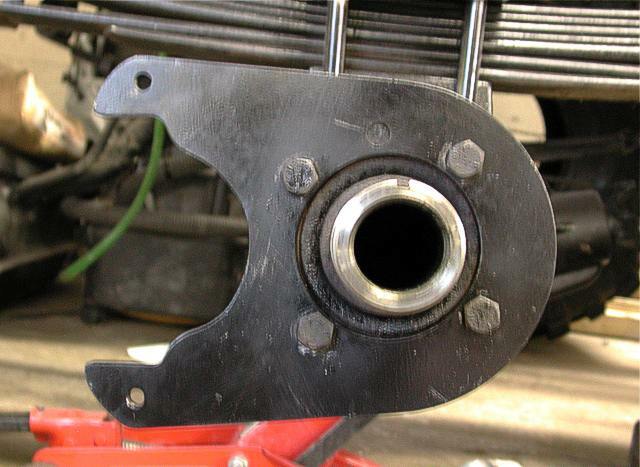 First you need to remove the 8 bolts shown here and slide out the axle shaft. 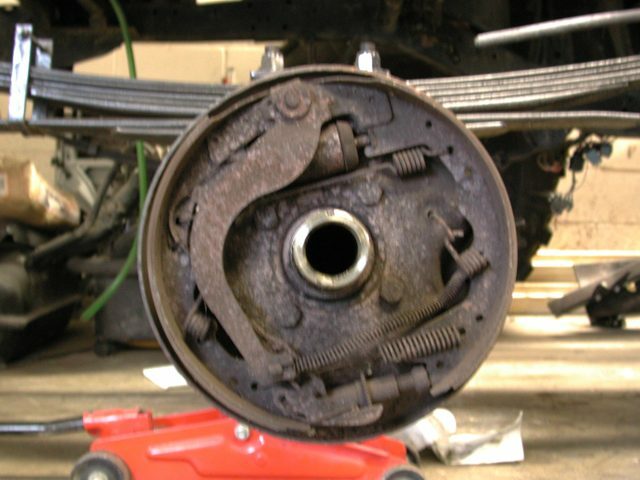 The wheel bearings on full float rear axles are packed with grease however the axle lubricant does reach the wheel bearings and will spill out. I suggest putting a bucket under the work area and have a few rags ready. Now you will need to remove the outer nut. First use a screw driver to flatten the lock washer tab or tabs that have been bent over. Remove outer nut, lock washer and inner nut. 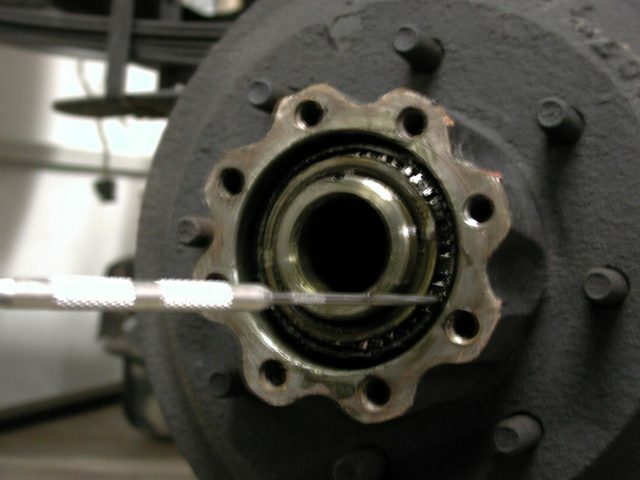 Now you can remove the outer bearing. Pull the drum and hub off. 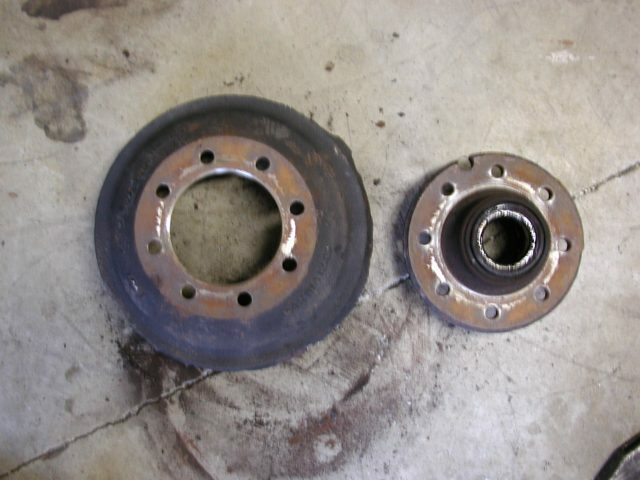 Now you will need to remove all the wheel studs to separate the hub from the drum. I recommend replacing all the wheel studs at this time. 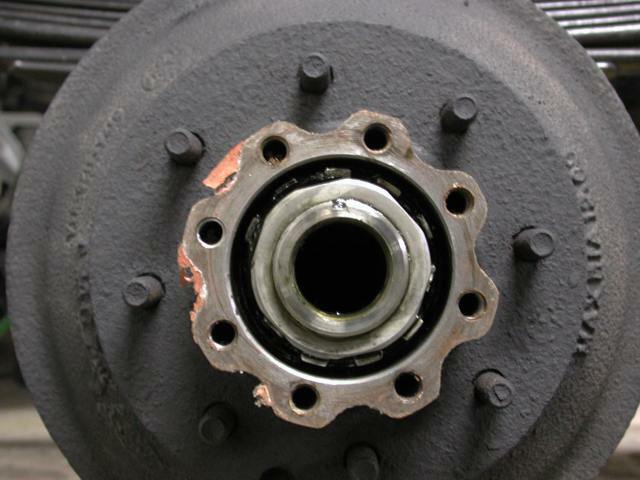 You will also want to inspect, clean and repack the wheel bearings. At this point you will need to unhook brake and E-brake lines. Then remove the 4 backing plate bolts and remove backing plate. Now we can start putting new parts on. 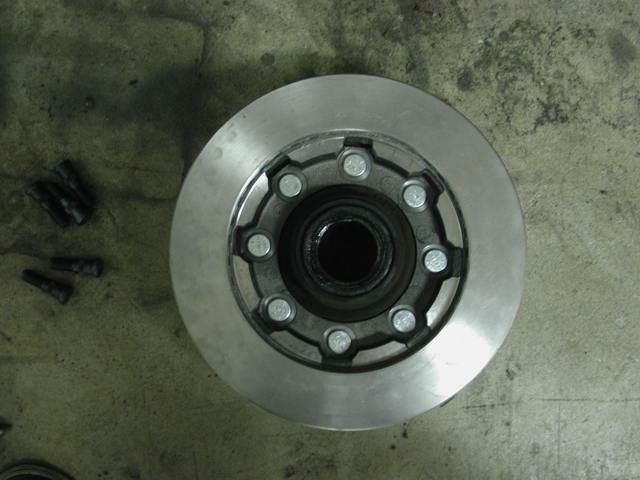 The new rotor is installed on the rear of the hub. It is retained by the wheel studs. Press or hammer the wheel studs in. I used a hammer and long punch. Install backing plate on axle housing. 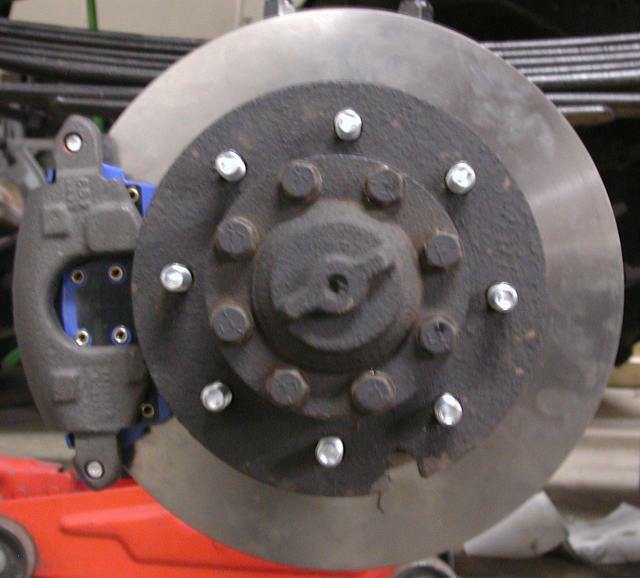 Caliper mounting facing rearward. Install hub and rotor assembly. First retaining nut, lock washer then second retaining nut. Bend over one or 2 of the lock washer tabs. Slide in the axle shaft and install 8 retaining bolt. Tighten axle shaft bolts to 70-85 ft. lbs. Install caliper with the 2 supplied pins. Bleeders facing up. Overall the kit is a quality piece. The bracket is heavy duty and the cuts are precise. Installation was very easy. Randy (the owner) was very helpful on the phone and the order was promptly shipped. I ordered the non-E-brake with caliper kit. It was $285 plus S&H.